The row of shophouses at Syed Alwi Road towards Victoria Street (which runs more or less parallel to Jalan Besar). Syed Alwi Road is a rather long road. The row at this stretch has decorative "mirror" motifs with windows as the reflective panel instead of mirrors. Similar designs (though not for windows) can be found in other shophouses in the area, like the one below along Jalan Besar. According to a write-up by the National Heritage Board, Syed Alwi Road was near a swampland (as late as 1924). 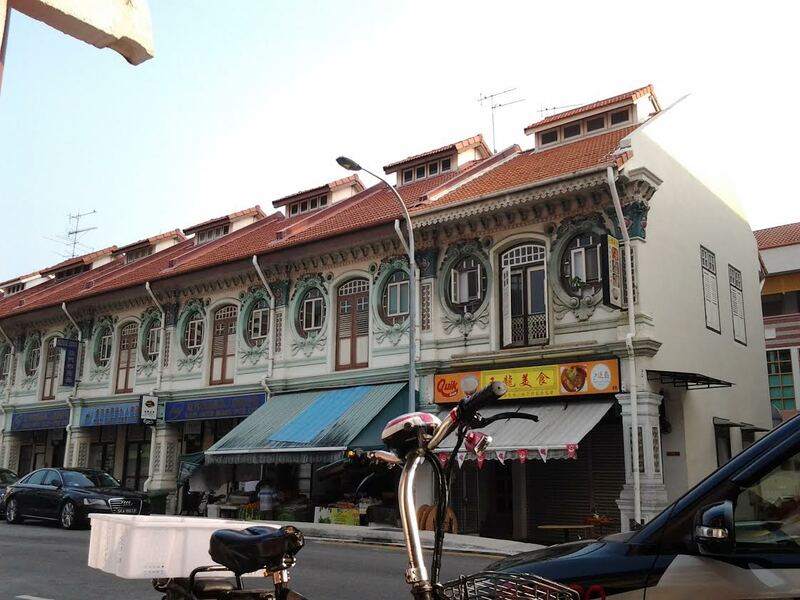 Built in 1850s, it was originally named Jalan Bahru. Later, it was named after Justice of Peace Syed Alwi, son of Syed Ali who bought 70 acres of swampy land around the region, and noted for constructing wells at Selegie Road and even in Telok Ayer and Mohamed Ali Lane in Chinatown, to provide water for the public. Read about its history here: http://www.nhb.gov.sg/places/trails/jalan-besar/trail-sites/historic-sites/syed-alwi-road. Mirror, mirror on the wall... Decorative motifs on a row of shophouses at corner of Kitchener Road where it meets Jalan Besar. Bits & Pieces...Click on photo to enter. Old shophouses have covered walkways that you can stroll along and look at window displays. Commonly found on facade of old shophouses. Traditional ones are those in thick wood -- gold letterings over black. Probably built between the1900s and 1940s during which decorative motifs were common. Notice the little "knob" at the end of the roof ridge? Ronald G Knapp's book, China's Old Dwellings, has good description on the various forms of gables. Apparently, in the old days, the corners of the roof ridges were reinforced by such knobs (which may take the form of more decorative motifs ) to "weigh down" the roofs as these corners were believed to be most vulnerable during strong winds.